Just opposite Cape Tribulation Camping, Lot 11 on Cape Tribulation Road, is the Dubuji Boardwalk. The boardwalk leads directly to Myall Beach where this view can be seen when looking south. This pristine beach has a fringing coral reef that’s exposed at low tide: a great place to explore the rockpools. Inviting as it looks, you can’t swim here in summer stinger season. 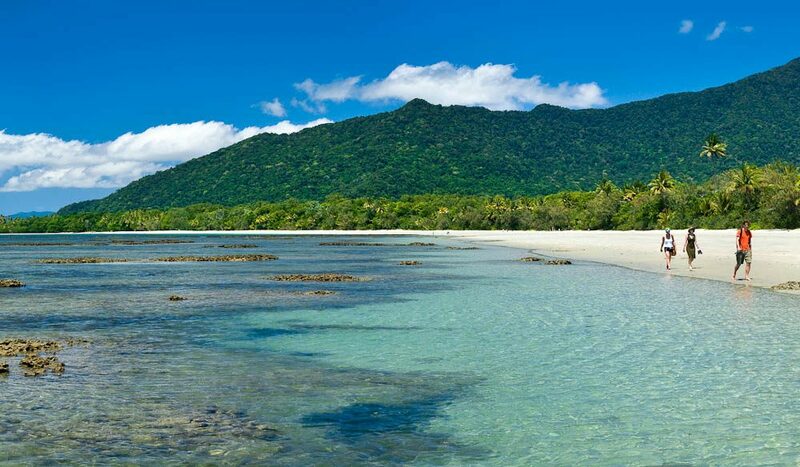 It’s also one of the many Tropical North Queensland beaches where the Daintree rainforest fringespristine white sand.